The time has come folks! 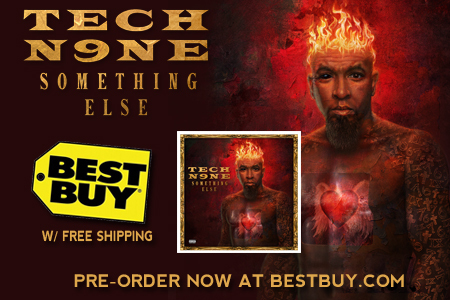 Something Else is only a few days away, and we’ve linked up with Best Buy to make sure Tech N9ne’s loyal F.A.N.S. get the new album any way they want, and at a reasonable price. The Standard Edition – $9.99: This is the basic edition of the album, a 17 track magnum opus of genre-bending hip hop from the general himself. The “All Access” Deluxe Edition – $14.99: This version comes with a collectible laminate, a behind the scenes DVD and 3 additional tracks! The Collectors Vinyl Edition – $24.98: This version contains all the tracks from the Deluxe album, on 2 red vinyl LP’s! Perfect for the hip hop purists and collectors! Not only does Best Buy have PLENTY of albums stocked to keep Technicians satisfied nationwide, the Strange Music social media team will be looking for fan pictures to feature on the blogs as well as Facebook and Twitter, so when you go to cop the album, make sure to snap a picture of you in front of the store with your album in hand! We want to show the world how supportive our fans are, so on release day swarm your local Best Buy and ask for Something Else!!! In the meantime, why not take the pledge? THE DELUXE EDITION OF ‘SOMETHING ELSE’ FROM BEST BUY!